The ability to switch between a case sensitive and case insensitive comparison is the challenge because it needs to be done on a database that inherently does not discriminate between the two. In this post, I will present one method of implementing this requirement. If you have any others that you would like to share, please feel free to do so in the comments area. The most common implementation pattern to realize the case sensitive search requirement is to temporarily use a collation that is case sensitive as shown below. To begin with, let us create a test table and insert some fictional test data. Next, let us fetch the collation of the database where our test table resides. You may also want to use the system stored procedure (sp_help) to study the collation of the table columns (which by default would be same as that of the database in which the table resides). On my server, the collation was – [SQL_Latin1_General_CP1_CI_AS] which is case in-sensitive (notice the CI in the collation name). Now, attempt to query the table for all products whose names begin with the letter ‘c’ (small case). To do so, we need to temporarily COLLATE the column – dbo.Product.ProductName to a case sensitive collation (in my case, this is SQL_Latin1_General_CP1_CS_AS). As can be seen from the image below, desired results are obtained. However, if one has the actual execution plan opened up, an interesting observation can be made if we look at the properties of the SELECT operation. 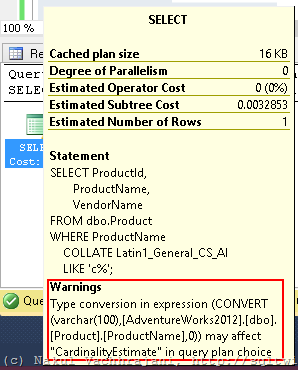 We can observe that SQL Server internally uses the CONVERT function with a style of 0. Per Books On Line (see references below), this indicates a binary to character conversion. This conversion is performed for all records in the table, which in-turn affects performance. Because we have the overhead of applying a conversion on all rows of a particular table, this method should be used only when the column cannot be modified to permanently use a case sensitive collation and a business need exists to provide both case sensitive & insensitive search. 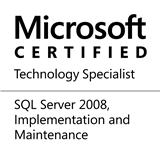 This entry was posted in #SQLServer and tagged #SQLServer, #TSQL, Administration, DBA, Development, HowTo, Tips on February 9, 2015 by nakulvachhrajani. this is really intereseting and useful post. but please, change your WP theme or design, its horrible. Hello! Thank-you for your feedback! I’ll review a couple of other themes and I find one that’s better, I’ll most definitely switch over to the same.